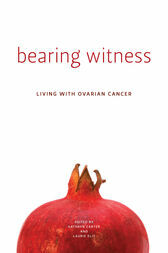 Bearing Witness is a collection of stories from women who went through the diagnosis of ovarian cancer, and treatment for it, only to find that the cancer recurred and any hope of recovery was gone. These women represent a spectrum of ages, ethnic backgrounds, marital circumstances, and professional experiences. From their stories we learn how each woman shapes the meaning of her life. Facing a life crisis can make one bitter and angry, but it can also provide the key to a thankful and generous spirit within. Storytelling is an important art form present in many cultures: it is a way of processing life events, of searching for meaning, and of allowing teller and listener to wrestle with the message. It is a form of teaching and learning. For the women in Bearing Witness, stories are tangible legacies for family and friends and a chance to share their thoughts on living with the “glass half full.” They inspire the reader to reflect on life’s struggles and to find within themselves a sense of optimism, perhaps when they least expect to. Kathryn Carter’s concluding essay places these stories in the context of contemporary discourses of illness and healing.